So you’ve decided you need a fight scene in your book. You’ve researched fighting techniques and weapons. You’ve done your homework on war wounds. And you’ve come to the conclusion that a) the scene has to be told from the POV of an experienced fighter and b) it needs to be detailed. This is where fight scenes can get tricky. A one-on-one fight scene between two skilled characters needs to balance your level of research and your readers’ expectations. Your research tells you a fight scenes should be short. But it falls as the climax of your book and your readers expect some sort of payoff for waiting for 200+ pages for this fight. Too short and they’ll walk away disappointed. Your research tells you all the moves that a fighter can or cannot do, but your readers’ expect to be able to follow the fight without a lot of jargon. Yet they want it detailed. Are you thumping your forehead on the table yet? This is where you take a page out of Hollywood’s fight scene textbook and choreograph your scene. Every fight scene in a movie is choreographed to give the illusion of reality (though the level of success can be debatable). The illusion of reality is what you’re striving for. Perhaps the fight extends longer than it would in real life. Perhaps the movements are played as if in slow motion so the reader can follow along. But, the reader will be so caught up in reading the scene that those things won’t matter. The fight scene will still feel real. 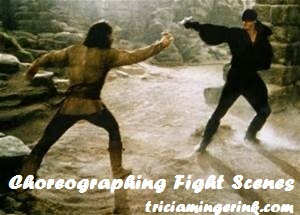 So how do you set about choreographing a fight scene in a book? 1. Work Backwards. I’ve heard this tip given for everything from editing to outlining, and it works really well for fight scenes. Figure out how you want the fight to end first. How is the opponent disarmed? Are they killed? Wounded? Do they get away? Or perhaps win? Once you know how the fight has to end, you can work backwards to bring the fight to that point. 2. Whole Body Motion. In a fight scene, your character isn’t just moving their hands. They are moving their feet, twisting their bodies, setting themselves up for the next move. For each move your character makes, you need to figure out where it puts their body. If they just did a wide swing to their left, they will have to move differently depending on if they want to follow up with a back stroke, downward stroke, or upward stroke. 3. The opponent wants to win too. The opponent wants to win just as much as your POV character. He/she won’t simply react to what your POV character does. Your POV character will be just fighting a statue if that were the case. Have the opponent throw your POV character off balance and do things your POV character did not expect. 4. Picture the fight. This can be tricky to do depending on how your imagination works. What works best for me is closing my eyes and running the fight scene through my head like a movie in slow motion. I tweak the positions of the characters’ hands and feet. Sometimes (when I’m by myself in my room), I’ll close my eyes and pretend I’m one of the characters. I’ve heard some people like drawing stick figures. Whatever method you use, it should be something that lets you test your choreographing until it flows smoothly. 5. Write it. Once you have a clear picture in your mind, write out the fight scene. Once it is written, you can go back in editing and decide what movements are necessary for the readers’ understanding and what are implied. When you have the movement pared down to the essentials, the fight scene will flow quickly, even if it takes a page or more to tell. These are things that work for me. Any fight scene tips that work for you?